The Federal Government plans to export fresh vegetables worth $10 million in 2013, Mr. Mike Kanu, Deputy Director, Horticulture in the Federal Ministry of Agriculture, has said. Kanu said this in Umuahia at the commencement of the distribution of two tonnes of telferia seeds to selected farmers in Abia. He said that the Federal Government was poised to transform the horticulture value chain as well as promote the sale of perishable goods from Nigeria in the international market. 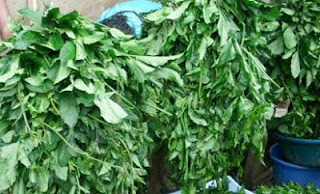 “Federal Ministry of Agriculture through the horticulture value chain called for the list of vegetable farmers producers of especially telferia, which is popularly known as ’Ugu’. This vegetable is one of those vegetables that are in high demand outside Nigeria. And based on its importance in the entire economy especially in health, providing the necessary vitamins and also as a major source of income to some major states in Nigeria. He said that no fewer than two hundred farmers drawn from the five states would benefit from the programme in the pilot phase. Kanu said that the farmers would be expected to establish 200 hectares of telferia farm across the country. Kanu said that the government was in partnership with the private sector in the initiative. “We have what we call the Agricultural Fresh Producers Growers and Exporters Association of Nigeria (AFPGEA) with major key players like Chief Olusegun Obasanjo and the Dangote Groups. “For which the government is trying to reposition to be in a better place to ensure the export of fresh produce from Nigeria to see if we can meet what other African countries are doing with exports produce. The Federal Mortgage Bank of Nigeria will continue to provide decent and affordable houses for Nigerians in line with Federal Government’s housing policy, the Managing Director, Mr Gimba Kumo, has said. Kumo said this at a media round-table session on Thursday in Abuja by members the Nigeria Union of Journalists (NUJ) and the bank. He said that the revised Federal Government policy on housing for the people was designed to take care of the critical needs of different categories of Nigerians. Speaking on the theme, ‘’The new initiative and business focus in housing finance’’, Kumo said that efforts were in top gear to sensitise every Nigerian to the new focus of the bank on mortgage financing. The managing director said the bank was working in collaboration with state governments and various agencies of government to provide decent and affordable houses for all the citizens of the country. He said that there were no exceptions in the new policy, noting that Nigerians, irrespective of their status, were eligible to benefit from its packages. In his remark, President of the NUJ, Mr Mohammed Garba, appealed to the bank to avail members of the union the opportunity to own houses. He solicited the assistance of the bank to enable journalists own houses in the FCT and others areas. Garba said that the FCT council of the union was already floating a cooperative society to secure a mortgage facility from the bank. He said that journalists had made sacrifices for the unity and progress of the nation, stressing that they deserved decent and affordable houses for their families. The NUJ leader said that the union would continue to support the bank in its task of providing mortgage facility for Nigerians to own decent accommodation wherever they wanted. The forum, one of numerous efforts made by the union to improve the welfare of its members, was attended many journalists and stakeholders in the housing sector. The Management of 3T Impex Consulting Limited hereby introduce our Export Skill Acquisition and Mentoring Programme (ESAMP) to individual/organization (Politicians, government, NGO, philanthropist etc) who are looking for sustainable youth empowerment programmes to sponsor in their communities, local governments, states and geo-political zones. 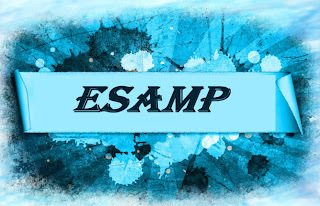 ESAMP is designed to give the Nigerian graduates hands on training in the area of non-oil export. This training will enable them acquire the skills that are necessary for them to export different items (like food items, solid minerals and Agricultural commodities) from Nigeria and thereby earn foreign exchange and at the same time boost our foreign reserve. This programme goes beyond the training (which includes export and entrepreneurship training) for 3weeks in the sense that, it includes aggregating them into groups of cooperatives after the training. The sponsor then provides funds for each of the cooperatives and with this we can then take them through an Export Mentoring programme. 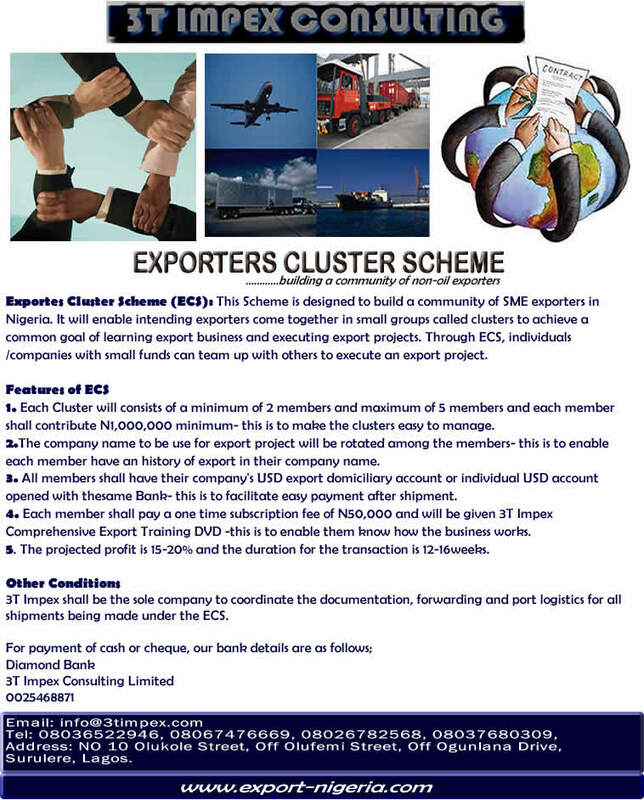 The mentoring will involve hand holding them through the export processes (which include export planning, getting buyers abroad, sourcing good quality products, export documentation and port logistics) during their first sets of shipments till they can stand on their own and thereby becomes employers of labour. This programme is unique and very laudable in the sense that it will expose the trainees to the potentials of the natural resources in the different geo-political zones of Nigeria, create entrepreneurs from among them and thus make them to become employers of labour in the nearest future. This will consequently increase employment opportunities and thus reduce poverty in the nation. The ESAMP has been logically and systematically divided into five phases namely: Export Training, Aggregation into Cooperatives, Export Planning, Export Financing and Export Mentoring. The first three phases of this programme will take place in a camp while the remaining phases will take in their various locations upon receipt of funds from the sponsor. 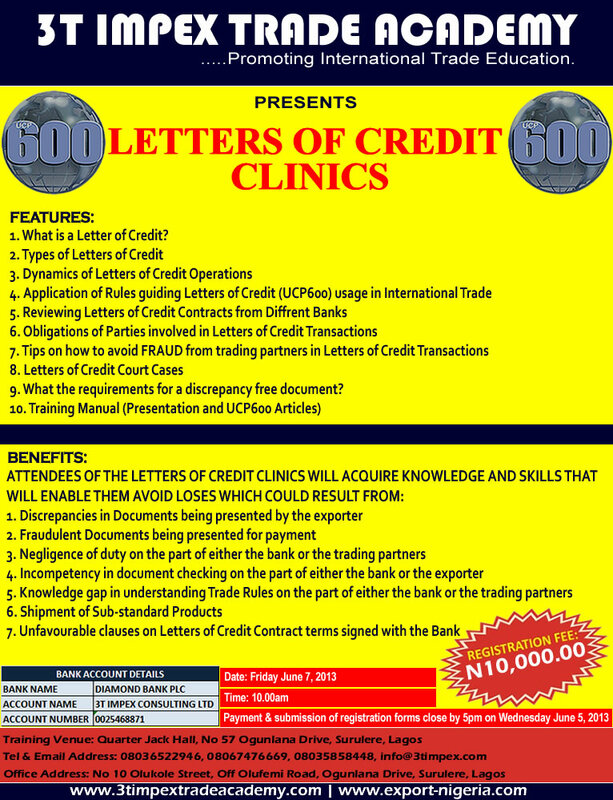 The training will be done in batches depending on the number of people the financier intends to sponsor. 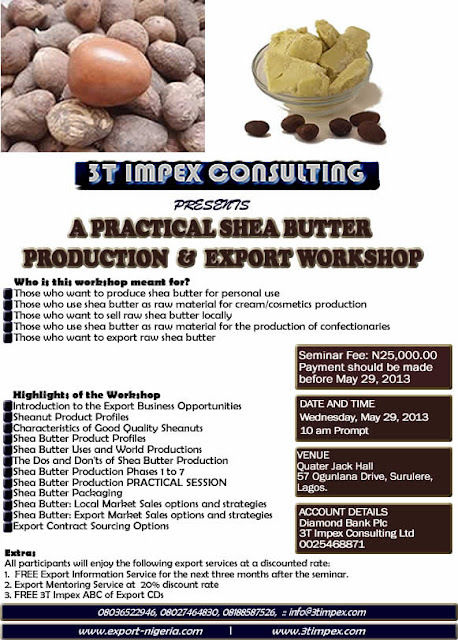 Interested candidate will be asked to submit business plan on exportation of any Nigeria product or commodity. 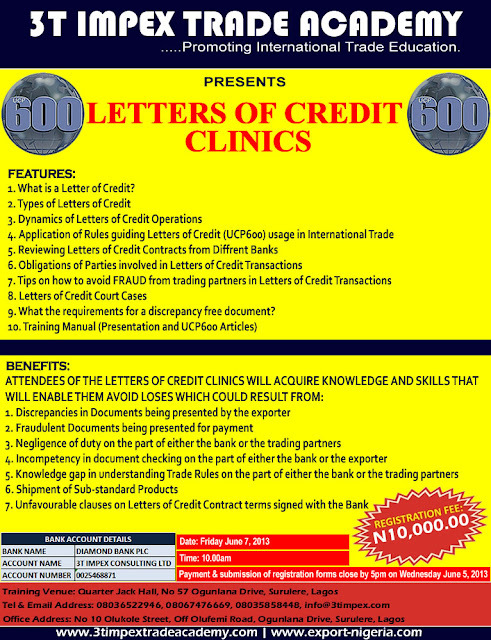 The candidates with the best 200 business plan will then undergo the training phase of the programme. At the end of the training, the candidates will be allowed form 10 cooperatives of 20 members each. Each Cooperative will be given N30Million as a grant to commence their export businesses and share the proceeds. This fund will be treated as a convertible loan from federal which will be converted to grant if they perform well and make significant progress in their export operations and or withdrawn from them if the funds are mismanaged by the group. The ESAMP has numerous benefits and this include Building a self –sustaining system to empower the Youths and grow their SME export businesses. It will cause increase in demand for both Agric commodities and solid minerals and thereby create more Job for the farmers and miners and this will in turn reduce poverty among the good people and boost the economy. This initiative will create a legacy for which all the good people of the Nigeria will remember and be forever grateful to the sponsor. We are willing to sell the copyright of this idea to any individual/organization (Politicians, government, NGO, philanthropist etc) who would like own the idea and implement by themselves or with our support and input. Re: [Exporting From Nigeria] New comment on LEAD ORE SUPPLIERS URGENTLY NEEDED. Subject: [Exporting From Nigeria] New comment on LEAD ORE SUPPLIERS URGENTLY NEEDED. Hello sir, please I need supplier of lead ore, is there a way u can help me with a good supplier that can deliver to lagos? Best regards sir. The Nigerian Export Promotion Council (NEPC) has launched e-registration Website and e-registration booklet to reduce the volume of consignment leaving the country through informal exports. The Executive Director, NEPC, David Adulugba, who said this at the launch in Abuja expressed regret that the quantum of goods leaving the country annually without documentation was worrisome. 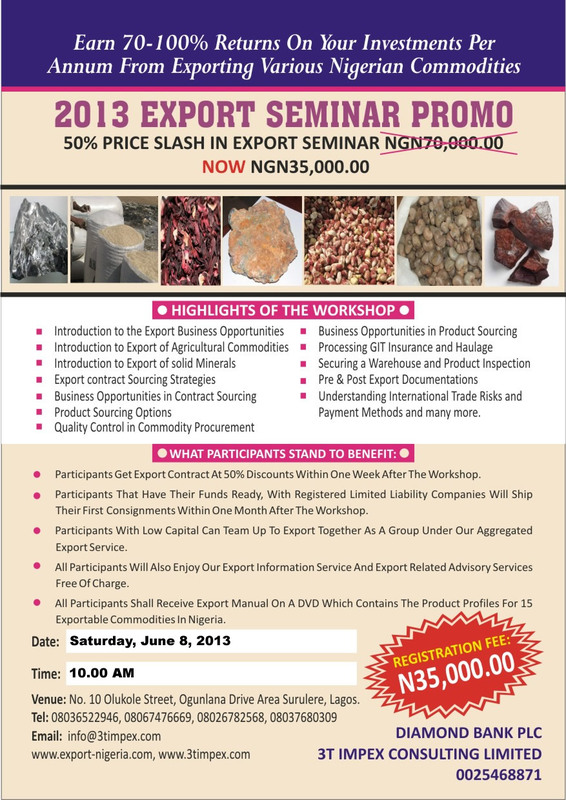 Adulugba said the launch of the site - www.nepc.gov.ng - and the booklet was vital to the growth of the non-oil export sector. 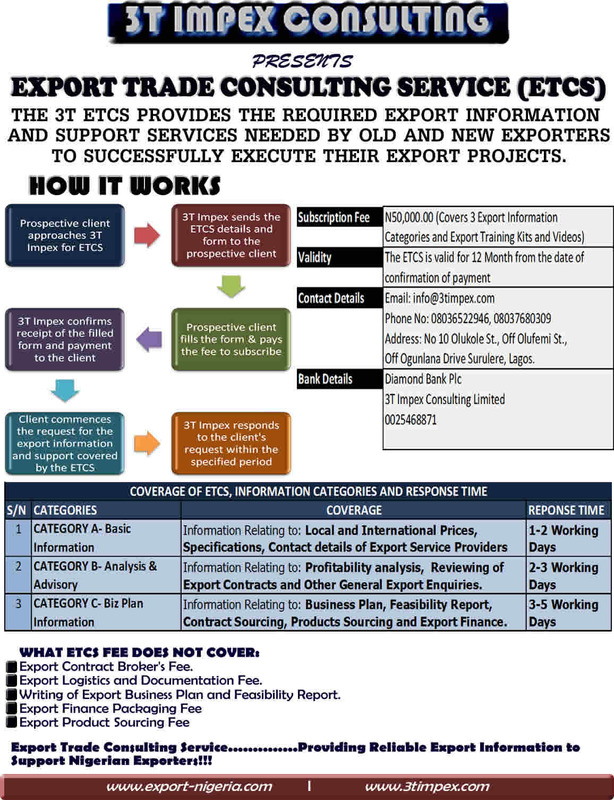 He said the initiatives would enhance the process of registering products meant for export as well as assist in capturing data of the informal trade between Nigeria and other countries. Adulugba said findings by the agency revealed that there were 48 loading points where goods were exported to other countries informally. He expressed concern that more than three quarters of the goods leaving the country were informal, adding the agency was ready to tackle the problem promptly. He said that normalising all informal exports would help to grow the economy. Adulugba said NEPC had also established e-registration office at the headquarters to change the usual bureaucratic approach in government business as well as help in registering exporters and bringing the much-needed foreign direct investment to the country. The NEPC boss said the initiatives would promote the council’s activities in all the available social network sites on the Internet. He said the features of the e-registration include development of a database system for potential exporters to upload all the necessary and required documents on registration for the purpose of verification.